I know it's only mid July, but some people are already getting ready for back to school. 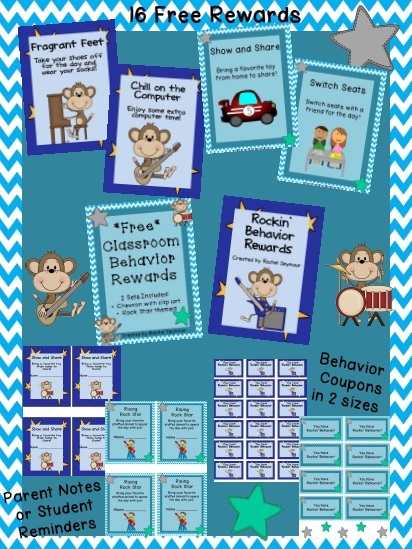 I did update my *FREE* Behavior Reward Catalog and wanted to share with you! I used it all last year and it was a huge hit with my kiddos! And the best part is that the rewards are free for me!! 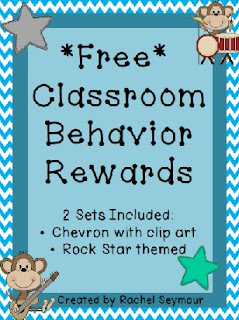 I should clarify that this pack is not free, but the rewards for your kiddos are free and that makes my reward system so much easier and cheaper!! You can purchase this pack at my TpT store here or my TN store here. 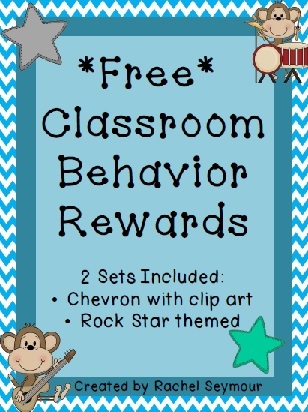 I have a Rock Star themed classroom so my Behavior Rewards matched that last year. This summer I decided to add another set that was chevron with matching clip art for everyone to use no matter what your theme! This pack is only $4.00 and can be used all year! Grab it this summer so you're ready to go when school begins. I used these rewards with Class Dojo and it was such a success last year for me that I will definitely be doing it again this year! You can read about how I implement Class Dojo by clicking *here* to read my post from last fall. Since this pack is updated I want to share it!! The first three people who share their classroom management tips with their email address will get this pack for free!! I am fairly lucky that I don't have to worry too much about bad behavior...guess I am too strict?! I am a big believer in setting high expectations from the start and holding everyone accountable. But I love the idea of free rewards...teachers already spend way too much money on things! I still haven't figured out the perfect system for my classroom. It varies from year to year. I try to stay consistent and break down/teach even the most minor routines and expectations from the very first day! Your behavior charts look awesome. We have never done a Rock Star theme yet, but I have seen lots of cool things to do with that theme. I use the clip up system in my classroom. Students earn honeybee money for clipping up. The money can be used to purchase rewards such as no HW passes, teacher helper, sit beside a friend, etc.